French domestic law on police use of force is broadly in line with international standards. But 2017 legislation allows the police to use firearms other than where necessary to confront an imminent threat of death or serious injury or a grave and proximate threat to life. The 1958 Constitution of the French Republic (as amended through 2008) is the fundamental legal basis of France's Fifth Republic. Although it does not include rights within its substantive provisions, the reference in the preamble to the 1789 Declaration of the Rights of Man and of the Citizen has been held by the Constitutional Court to mean that a law that violates those rights would be unconstitutional.Constitutional Court, Decision No. 71-44 DC of 16 July 1971.The rights protected by the 1789 Declaration include liberty, property, security, and resistance to oppression (but, surprisingly, not the right to life). The 1958 Constitution does not explicitly refer to the French police or the Gendarmerie (a paramilitary police force under the Ministry of Defence), though it does refer to the armed forces. In time of armed conflict, the Gendarmerie are to be considered as members of the armed forces. The actions of law enforcement officials are governed by the 2016 Penal Code. Negiligent homicide resulting from the acts or omissions of law enforcement officials (and others) is punishable by three years' imprisonment and a fine of €45,000.Art. 221-6, 2016 Penal Code.If the act or omission was wilful, the penalty increases to three years' imprisonment and a fine of €45,000.Art. 221-6, 2016 Penal Code.The Penal Code specifies, however, that immunity exists where the law enforcement official used a firearm where it was strictly necessary and proportionate with a view to preventing a murder or attempted murder that was proximate in time. ("dans un temps rapproché" in the original French text.) Art. 122-4-1, 2016 Penal Code.Unjustified violence resulting in mutilation or permanent disability is punishable by ten years' imprisonment and a fine of €150,000.Art. 222-9, 2016 Penal Code. Governing the acts specifically of law enforcement officials is the Code of Ethics of the Police and the Gendarmerie in France, which is included in the 2013 Internal Security Code.Code de déontologie de la police nationale et de la gendarmerie nationale (codifié au livre IV, titre 3, chapitre 4 de la partie réglementaire du code de la sécurité intérieure, entré en vigueur le 1er janvier 2014.Under this Code, any person in the custody of a police officer or gendarme must be protected from any form or violence and inhuman or degrading treatment.Article R. 434-17, 2014 Internal Security Code.Force must be used only when necessary and in a manner that is proportionate to the serious of the threat. 5. For the exclusive purpose of preventing the repetition, in a short time, of one or more murders or attempted murders committed when they have real and objective reasons to believe that this reiteration is the information available to them when they use their weapons. Use of force by France's police is overseen with the police service by the National Police General Inspectorate (L'inspection générale de la police nationale: IGPN). The IGPN comprises seven regional offices: in Bordeaux, Lille, Lyons, Marseille, Metz, Paris, and Rennes as well as an office in Nice. A separate General Inspectorate exists for the gendarmerie.Inspection Générale de la Gendarmerie Nationale.France has, though, been criticised by human rights groups, such as Amnesty International, for an alleged de facto state of impunity for the use of force by its police officers.See, e.g., Amnesty International, Public Outrage: Police Officers Above the Law in France, AI Index EUR 21/003/2009, London, 2009. In response to criticism, France established a national Ombudsman (Le Défenseur des droits) who is tasked by the Constitution with "overseeing respect for rights and liberties".Art. 71(1) 1958 Constitution (as amended).The Ombudsman has a broad remit, which includes police oversight. In a 2017 decision, relating to the use of tear gas in the arrest of 53 individuals at a music concert in January 2011, the Ombudsman criticised the police for the decision to fire tear gas canisters inside the building. This did not respect set procedure, nor was it necessary in the circumstances according to the decision. allegations of ill-treatment, the excessive use of force and the disproportionate use of non-lethal weapons, especially during arrests, forced evictions and law enforcement operations.Human Rights Committee, Concluding Observations on France, UN doc. CCPR/C/FRA/CO/5, 17 August 2015, §15. adopt effective measures, particularly in terms of training, to prevent law enforcement and security forces from using excessive force or non-lethal weapons in situations that do not warrant recourse to greater or lethal force. 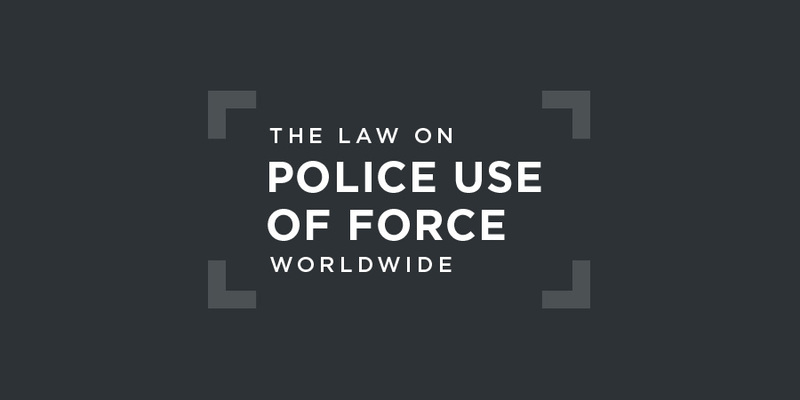 In that connection, the Committee draws the State party’s attention to the United Nations Basic Principles on the Use of Force and Firearms by Law Enforcement Officials. The State party should also ensure that allegations of racial profiling, ill-treatment and excessive use of force are thoroughly investigated; perpetrators are prosecuted and, if convicted, punished with sanctions commensurate with the seriousness of the crime; and victims are adequately compensated.Human Rights Committee, Concluding Observations on France, UN doc. CCPR/C/FRA/CO/5, 17 August 2015, §16. (d) reports of high numbers of cases being dismissed or discontinued, light administrative sanctions being imposed that are not proportionate to the seriousness of the actions, and a very small number of court-ordered penalties being imposed upon police and gendarmerie officers.Committee against Torture, Concluding Observations on France, UN doc. CAT/C/FRA/CO/7, 10 June 2016, §16. (d) Complete, disaggregated statistics are kept on complaints filed and reports received of acts of violence or excessive use of force, and on administrative or judicial inquiries opened into police or gendarmerie actions, prosecution proceedings launched, convictions and penalties handed down, and on cases proceedings dismissed or discontinued.Committee against Torture, Concluding Observations on France, UN doc. CAT/C/FRA/CO/7, 10 June 2016, §17. The European Court of Human Rights held in this case that there had been a violation of Article 2 (the right to life) of the European Convention on Human Rights. The case concerned the necessity and proportionality of the use of force by French law enforcement agencies in the context of the death of the applicants’ son, who was shot and killed by a gendarme while travelling in the rear of a fleeing vehicle. The Court stated that it did not wish to impose an impossible burden on the authorities. It noted that the gendarmes had earlier used alternative methods to try to stop the car and that the death of the applicants’ son had occurred during an unplanned operation during which the gendarmes had had to react without prior preparation. Nevertheless, in view of the fact that the driver had not posed an immediate threat and that stopping the vehicle had not been a matter of urgency, the use of a firearm by a gendarme not been absolutely necessary in order to carry out a lawful arrest for the purposes of Article 2(2)(b) of the Convention. The Court noted that after the events in this case France passed a law incorporating the principles laid down in the Court’s case-law, according to which law enforcement officials may use weapons only in cases of absolute necessity and in a strictly proportionate manner. This case concerned the death during a policing operation of an individual suffering from a serious mental health disorder. The applicants were the deceased’s brothers, sister, widow, father and mother. The Court found that there had been no violation of Article 2 of the European Convention on Human Rights, but there had been a violation of Article 3 (the right to freedom from inhumane treatment). The decision not to find a violation of the right to life was based partially on the relatively weak causal link that existed between the actions of the police and the death of Mr Boukrourou. back. Injuries included a fracture of Douet’s elbow and bruising on one arm, as well as an oedema on his elbow and bruises on his back. attached particular importance in reaching its decision.European Court of Human Rights, Douet v. France, Judgment (Fifth Section), 3 October 2013 (rendered final on 3 January 2014), §§35–36.The court found a violation of Article 3 of the European Convention on Human Rights (the right to freedom from inhumane treatment) on the basis that France failed to prove that the force used against Mr Douet had been both necessary and proportionate.European Court of Human Rights, Douet v. France, Judgment (Fifth Section), 3 October 2013 (rendered final on 3 January 2014), §§38–39.The Court further observed that "it is normally for the Government to provide relevant evidence that the use of force was both proportionate and necessary".European Court of Human Rights, Douet v. France, Judgment (Fifth Section), 3 October 2013 (rendered final on 3 January 2014), §30 (author’s translation). European Court of Human Rights held that the French authorities had failed to comply with its positive obligation to protect the right to life with respect to an inmate who hung himself in prison. The case concerned the suicide of the applicant’s son twelve days after he was admitted to prison.European Court of Human Rights, Isenc v. France, Judgment (Fifth Section), 4 February 2016. A French police officer who shot dead a young black man in western France in early July, sparking four nights of rioting, was charged with manslaughter. According to a report by Agence France-Presse (AFP), the unrest "has again highlighted tensions in deprived urban areas of France, where local youths often complain about heavy-handed policing and brutality." The officer had initially claimed he acted in self-defence while trying to arrest the 22-year-old in the city of Nantes on 3 July 2018, but later told investigators he had fired his weapon by accident. "He recognises he made a statement that did not conform with the truth", his lawyer told AFP.